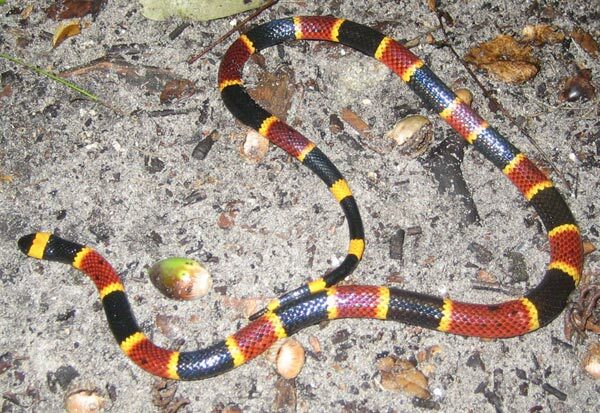 Red Touch Yellow, Kills a Fellow - this is the Eastern Coral Snake. You can see that it has red, yellow, and black bands. There are several snakes that mimic the color pattern of this snake, but this is the one with the deadly neurotoxic venom. You can see that in the arrangement of color bands, that red and yellow bands do touch. 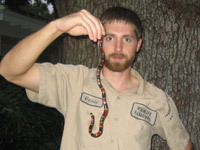 Here is a photo of a Eastern Coral Snake. Coral Snake Information - There are over 70 different species of Coral Snake that range from the Midwest in the United States all the way down through South America. However, in the United States these snakes are more common in southern states such as Florida, North and South Carolina and Louisiana. In these southern states you are sure to find these snakes living in wooded areas in rotting logs, thickets and meadows that are near water sources. Coral snakes are good swimmers, so they like to live near water if they can. Coral snakes can also live in Southern and Southwest states like Texas, Arizona and New Mexico. For coral snakes that live in these states, they make their homes in scrubland, wooded areas, grassland and farmlands but they can also live in rocky mountainous areas also. 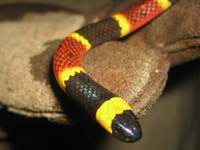 The coral snake is very resilient and can survive in a variety of regions. To learn how to tell the difference between the venomous coral snake and the harmless copycat colored snakes, read my Snake Rhyme page. Coral snakes are very striking and pretty with their unique color patterns that can be best described as red, yellow, white and black alternating bands. 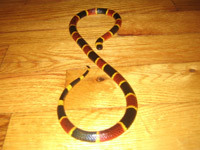 There have been many rhymes to describe the pattern of the coral snake in order to tell if it is venomous or not. There are other snakes that look similar to the venomous coral snake, but are not venomous. A general way (not a definitive way) of telling whether a snake is poisonous or not is saying this little rhyme when you see one: �Red into Black, venom lack; red into yellow will kill a fellow,� or �Red on yellow, kill a fellow; red on black a friend of Jack.� Remember that this is not a hard rule, but a general guideline and it only applies to snakes in North America. Some of the snakes that are regularly mistaken for a coral snake include the scarlet snake, milk snake and the king snake. Most coral snakes are small and thin, only growing up to three feet long, but have been reported to grow up to five feet long. The coral snakes that live near water will have a flattened tail that they use as a rudder to swim. The fangs of a coral snake are fixed to their upper jaw and do not revert to lying flat when they close their mouths, and this is why their fangs are a bit smaller. However, just because the fangs are small does not mean that their venom doesn�t carry a powerful punch. The coral snake has deadly venom, but because they are elusive there are not very many reported coral snake bites. The snake will use its venom to subdue its prey, but instead of using a strike method, the coral snake will chew its prey to inject the venom. The usual prey of a coral snake includes smaller animals such as lizards, salamanders, skinks, birds, rodents and other snakes. The coral snake has many predators that affect their life spans. Some of these predators include hawks, owls, coyotes, bigger snakes and larger dogs. A coral snake�s first line of defense is to flee or escape its predator�s grasp, but if it feels threatened it will strike. This is unfortunate for people who engage in a lot of outdoor activities such as hiking and gardening. If you should get bitten by a coral snake, or any other snake, you need to seek medical attention immediately. Fortunately, the coral snake is very elusive, only coming out of its territory during breeding season or after rainstorms. A good thing to remember is they will leave you alone if you leave them alone. Do not go out of your way to rid your property of them (unless you have a nest of them) because chances are that they will move on quickly. Click here for information and an Australia snake directory.